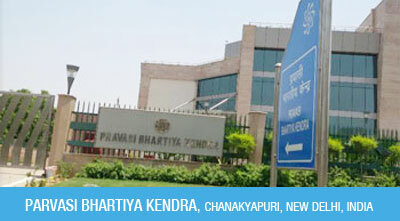 Pravasi Bharatiya Kendra located at the heart of the Capital in Plots No.15A, 15B and 15D, Dr. Rizal Marg, Chanakyapuri, New Delhi is a tribute to the overseas Indian community; and commemorates their migration to various parts of the world, the challenges they faced abroad, their achievements and contributions. The Museum in the Kendra will depict the history of migration of the overseas Indian community; their experiences and contributions. In the Kendra’s state - of-the art auditorium, multi-purpose halls, Conference and seminar halls –workshops and conferences with overseas Indians and on issues pertaining to them would be organized on a regular basis. The Kendra will also house the autonomous bodies India Centre for Migration, a think-tank working on issues pertaining to Indian migrant workers and the India Development Foundation for Overseas Indians, a not-for-profit Trust promoting contributions to flagship programmes in India. Global Innovation in Water Technology Award organised by the Energy And Environment Foundation to recognise and honour outstanding organisations that are taking responsibility for creating new, inspiring solutions to the society, new water technology and innovations, smarter water management, contributions to the protection of natural resources for performing outstanding work, community involvement. The Awards shall encourage and celebrate the responsible business movement across the globe. Global Water Conservation Award organised by the Energy And Environment Foundation to recognise and honour outstanding organisations that are taking responsibility for contributions to the conservation and protection of natural resources, promoting resource conservation, project exemplifies dedication, help farmer for performing outstanding work, community involvement and conservation education. The Awards shall encourage and celebrate the responsible business movement across the globe. Energy and Environment Foundation. Copyright © 2017, All Rights Reserved.